This is a common question tossed around by everyone at some point or another. At first glance the simple and obvious answer is sure, of course. It’s the same concept after all. Steep leaves (as opposed to grounds) and then strain them out with the plunger. Upon deeper consideration however you’ll find that steeping tea leaves in a french press isn’t the ideal way to brew loose leaf tea. Sure it works just fine but you have better options out there. Most avid tea drinkers will tell you that they have steeped tea in a french press; it is after all good for any steeping and straining activities. What they will also tell you is that when they use a french press to make their tea they have to immediately remove all tea from the press pot right away so as to prevent the tea from getting too bitter as it happens fairly quickly. When making coffee the plunger gets depressed all the way to the bottom but with tea you shouldn’t do this because it will squeeze the unwanted bitters from the leaves and in a related way the plunging action itself is a more delicate process in tea making. Tea leaves are shaped far differently then coffee grounds. They can clog the fine mesh a lot easier so you have to take greater care when stirring and pressing the plunger. Long story short french press pots are great for coffee and perfectly acceptable for brewing loose leaf tea but there are better tea brewing methods. However for travelers the french press is a great option as it’s portable, easy, and versatile. I have a list of good french press travel mugs here to review but you might be best looking for a travel mug made for tea as they usually have a tea chamber than can be removed from the mug after steeping is completed. Want to know the difference between a tea press and a coffee press? Let’s dig deeper. Can You Use A French Press To Make Tea? The French press was really design for brewing coffee, an equipment to make brewing coffee at home so much easy. However, this should not stop you from exploring other ways to benefit from the French press. Aside from coffee, tea is one of the most loved hot drink around the world. In some areas of the world, people prefer drinking tea than coffee. This could be true in Japan, China and Great Britain. The brewing features of the French press is practical for brewing tea too. The mesh wire and plunger will surely work well for making tea. But before you get all excited with using the French press for brewing tea, check out these important reminders and some expert tips to ensure that you get the best brewing experience. Many people make the mistake of brewing all tea leaves the same way. We need to understand that each kind of tea leaves hold special properties and unique flavor. To bring this out, the right steeping, water to leaves ratio and brewing is needed. And even if you are using a simple French press, you can keep observe the correct tea-making process. Most common type of tea in North America. It is high in caffeine compared to other tea. Black teas tend to feature deeper, darker flavors, such as dark chocolate, spice, earthiness, citrus, and malt. Oolong tea has a lot of variety with oxidation ranging from 8% to 90%. Light oolongs feature flavors closer to green tea with floral, citrus, and nutty notes. They can be very sweet and pleasant. Dark oolongs end to feature flavors closer to black tea with earthy, fruity, and woody notes. They’re also complex and pleasant, but often not as sweet. In China, green tea is a like a house staple. If Americans love coffee, Chinese love their green tea. Brewing time is short in order to preserve the light and fresh taste. Green tea flavor hints on flavors include herbs, flowers, nuts, earth, and citrus. White tea is less oxidized and has a light flavor and taste too. It has a short brewing time similar to green tea. The flavor profile is also delicate, featuring gentle notes of flowers, herbs, and some light fruits such as peach. Herbal tea is technically not a tea because it did not come from the camellia sinensis plant. But since you can brew them, you can call it a tea, for that matter. Herbal tea could be anything like the bark of a tree, its leaves, flowers or even fruit peelings. 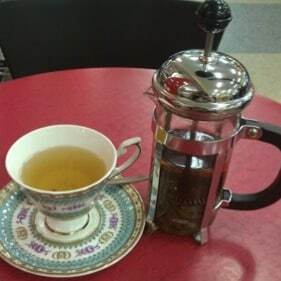 Making tea with a French press is so simple and easy. Here is a step-by-step guide on how to perfect that cup of tea. Clean the French press thoroughly. If you have been using the French press for brewing coffee, the smell of coffee clings to every part of the press. Wash it well with water and mild detergent. Make sure that no coffee ground is left in the plunger. Scrub it thoroughly. But do not pour boiling water on the carafe. Let it cool for about 30 seconds. The boiling point is 212 degrees Fahrenheit. We want to achieve the desired temperature between 180 degrees Fahrenheit to 205 degrees Fahrenheit, depending on the kind of tea that you are making. Place tea leaves at the bottom of the carafe. Add your desired amount of dry tea leaves to the French press carafe. For example, in a four-cup press, you may want to add around a quarter of a cup of dry tea. Let the leaves steep to achieve the desired flavor. Tea leaves are easy to steep than coffee ground. It will take you 3 minutes or less to steep tea leaves and they are ready to press. Press the plunger all the way down until the leaves are almost squeezed out. Pour the tea into cups and serve warm. Make sure no liquid is left in the carafe. If you are serving guests, you can put the tea in a pot. Serve the first batch and start a whole new batch. If you are shopping the market for a new French press, Spruce Eats recommend the following models and brands. Go check it out. • Le Creuset of America Stoneware Petite French Press – Special features: Has a nice heft and maintains temperature, so it’s ideal for keeping your coffee warm. It’s also safe for use in the freezer, microwave, oven, and dishwasher, so the carafe can be used for much more than coffee. • Frieling Double Wall Stainless Steel French Press Coffee Maker – Special features: Sleek design with full stainless steel body. Insulated carafe, perfect for serving coffee at the table for breakfast, snack or when having a coffee party at home. Full length handle to avoid slipping. All parts are dishwasher safe. • Bodum CHAMBORD French Press Coffee Maker – Special features: Can make up to 12-ounces of coffee. Has a heat-resistant borosilicate glass carafe with a plastic handle and base. Easy to clean. • Bodum BRAZIL Coffee Maker – Special features: Can make up to 34-ounces of coffee. Perfect for a small family. Affordable French press model. All parts are dishwasher safe. • KONA French Press Coffee Maker – Special features: Very durable, perfect for busy family that fears glass and any breakable items. Has 12-ounce and 34-ounce models. All parts are dishwasher safe.